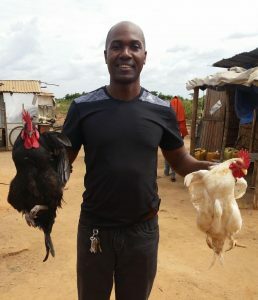 African Chicken is a Tanzanian business that fights unemployment, poverty, and hunger, with chickens. Their goal is to increase rural household communities’ income from less than $1 to $2 by 2020. The company provides chickens to rural women, who they pay to raise them for four months. Then the firm collects 90% of the chickens, and sells them to hotels, restaurants, and other large buyers. The women keep 10% of the chickens for themselves. Africa Chicken aims to scale up the annual production of 300,000 chickens by 2019 with revenues of about $2 million dollars. Their model is being studied by universities, small holder chicken producers, NGOs, government agencies, and also the Tanzanian Livestock Research Institute. This project is led by John Kayira. African Chicken is a Tanzanian business that fights unemployment, poverty, and hunger, with chickens. Their goal is to increase rural household communities’ income from less than $1 to $2 by 2020. The company provides chickens to rural women, who they pay to raise them for four months. Then the firm collects 90% of the chickens, and sells them to hotels, restaurants, and other large buyers. The women keep 10% of the chickens for themselves. Africa Chicken aims to scale up the annual production of 300,000 chickens by 2019 with revenues of about $2 million dollars. Their model is being studied by universities, small holder chicken producers, NGOs, government agencies, and also the Tanzanian Livestock Research Institute. How to you get the women involved? Any women can be selected. We have a center where selected women are trained on how to start a poultry farm for free. And after graduation, they are free to work with us or on their own. Based on the model how are deficiencies accounted for? For instance if out of the 100 chicken given 10 were dead. We use the surviving rate to calculate the percentage pay. Meaning there are no penalties for dead birds. What has been the response to this model in Tanzania? It has been overwhelming and we plan to expand in Tanzania and different areas and also support initiatives in other parts of Africa to do this and improve lives. Do you have any help with such a very important initiative? Not quite except for Mentor Capital Network and Fledge based in Seattle Washington. However a lot of organizations would like to help our initiative but since we are a limited liability company no one is willing to help us. In fact the Gates Foundation would have like to give us 2 million if we drop our model but that was not an option I accepted. NGO is not a solution to Africa’s problems. With NGO’s and grant when you are given money and services you exhaust it and ask for more. That creates a dependency situation. With my model, people are able to do something for themselves. In fact for profit encourages people to help themselves. We need a model that will help me and my people and not a model that creates dependency. USAID wanted to help us but they wanted us to drop our model. People’s idea of helping Africa is not sustainable. Very good. We have more women participants than we can handle. So we are planning to see regional development. We started with 6 women and now we have more than 600 women more than we can handle. So we will encourage regional development. If you give someone $10000 today and tomorrow you see that he has $11000 that’s good but if tomorrow you realize that he needs 10000 more, that’s not a good model. We are able to make a profit. We don’t want investors that will change our model. We need people that will share our vision not just bring money. We don’t want any model that will create dependency. My plan is to have African Chicken Country wide. No franchising is not necessary. My target is to reduce poverty in Tanzania. We will happily give information to anyone who wants a startup for free. My vision is to see many women come out of poverty.